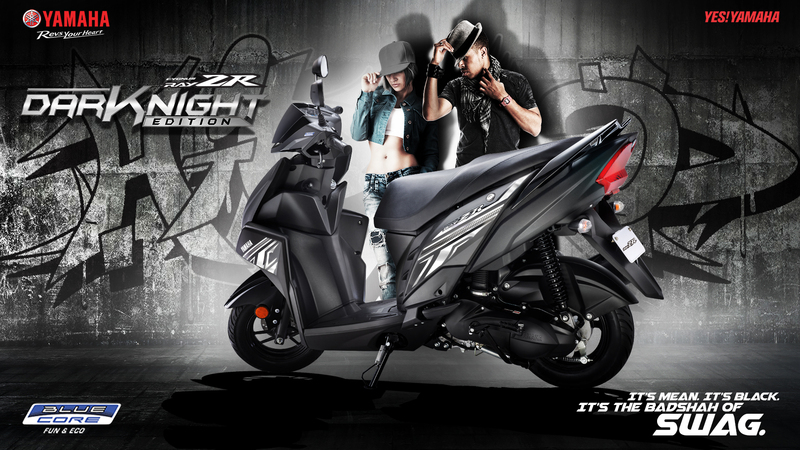 Yamaha recently launched the Ray ZR DarKnight Edition in India for INR 56,898. The special edition scooter costs INR 1,000 over the regular top spec Ray ZR and carries an all new livery that brings white design lines over an all Black scooter. Everything including the design and performance of this scooter remains the same as standard version. Yamaha Ray ZR starts from INR 53,451 for the drum brake variant while the one with disc brake and alloy wheels can be bought for INR 55,898. The prices mentioned here are ex-showroom Delhi. Unlike the initial days, they are varying with change in state names on the official website. The front fascia is covered in Matt black while gloss black front fender creates a unique essence for this sporty scooter. The same finish is found on rear grab-rail and everything else is seen dipped in Matt black. This typical edition comes with front disc brake and black alloy wheels as standard. Ray ZR rivals Honda Dio in its segment.